Celebrating over 40 years of dedication, passion and creativity has made us one of the premier salons in New Jersey. Our personalized attention and sharp focus on every last detail will give you just the results you’re looking for. Like us on Facebook today to see all of our latest specials! Write a Review for The Hair Designers on Google and receive a Discount on your next service! 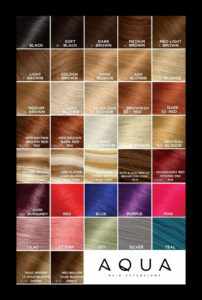 Now The Hair Designers is an exclusive carrier of Aqua Hair Extensions! Used to add a pop of color, add length & volume, or even create an entire new look! These are 100% human hair that leave you with no damage,and no commitment ! Call Today for a consultation!